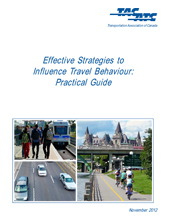 Various governments and organizations across Canada are investigating strategies to motivate sustainable travel habits among Canadians. Social marketing is one of the tools that can be used to shift long-term consumer behaviour. It emphasizes the need for a thorough understanding of target markets, motivators and barriers to desirable behaviours. Users of this Guide will understand the need for holistic, market-based social marketing approaches to influence travel behaviour. Public and private sector organizations will also learn which transportation demand management tools are effective in their jurisdictional, community and strategic contexts. Keywords: Traffic and transport planning; behaviour; journey to work; legislation; marketing; policy; publicity; road user; selection; textbook; traffic control; transport mode.